An eye-opening examination of the stupid things smart people do-and how to cultivate skills to protect ourselves from error. 'As a rule, I have found that the greater brain a man has, and the better he is educated, the easier it has been to mystify him,' Houdini to Arthur Conan Doyle Smart people are not only just as prone to making mistakes as everyone else-they may be even more susceptible to them. 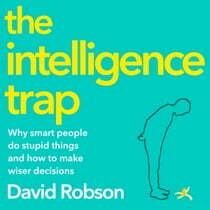 This is the "intelligence trap," the subject of David Robson's fascinating and provocative debut.